And it's a very happy hello! This card isn't a new one. I actually made it for the June/July issue of Designed to Color. I followed the sketch call and used Tadpole Polly for a very summer inspired card. I love how this one came together but to be honest, looking at it now, it makes me miss the summer I didn't have just a bit. Time has flown by and the nights here are already cooling down. Luckily, fall is my favorite time of year anyway and I'm hoping that this new season will bring with it some amazing changes. 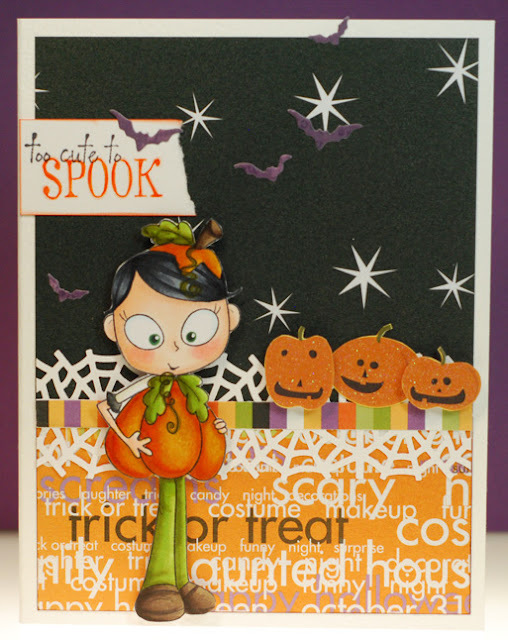 There are plenty more spooktacular cards to get you in the Halloween spirit over on the ATS blog so be sure to check them out as well. Well would you look at that? Two posts in two days! It's been awhile since that has happened, LOL! The video runs about 18 minutes but when you consider that is coloring the whole image and background... not too shabby. And all together I was able to create the entire card in under 45 minutes, which works great within my current schedule. And I have to say that I'm glad I finally made the time to color this Beatrice up. I've gotten a handful of new summer type stamps these past few months and I'm just now realizing that my window to use them this season is drawing close to an end... yikes! I want to do my best to ink up this sad, and as yet unloved rubber so we'll see how well I do. Anywho, I should go get myself ready for work. Hope your week is off to a great start! I also have some exciting news to share about my mom. Yesterday her kidney doctor talked to her about how it looks like her kidneys are finally starting to work again. So he has decided to skip her regularly scheduled round of dialysis on Monday and check her numbers again after that. We are praying that this means she may finally be done with dialysis once and for all. Which, if that happens, will only help to speed up her release from the hospital. OMGosh, I can't even tell you how excited I am by that possibility! 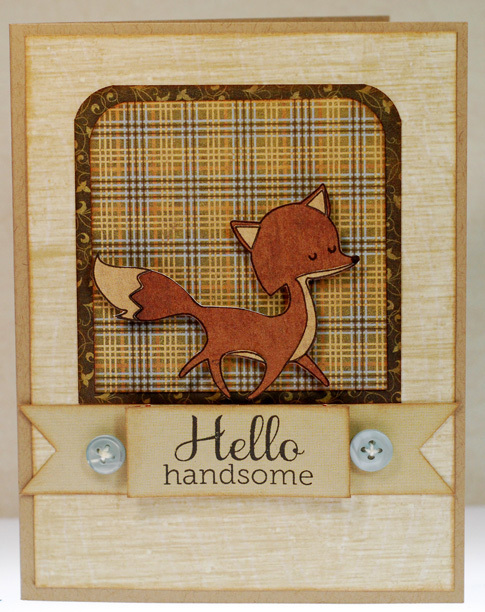 Anywho, keep cool my stampy peeps and know that I miss visiting you all and feel so out of the crafty loop! 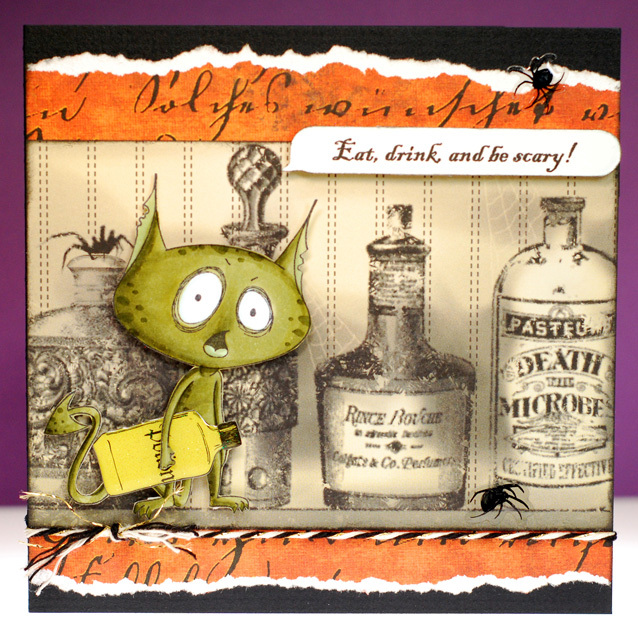 Anywho... it's another review preview day over on the ATS blog today and even though I didn't make a card for it I still had this fun Frankie Stein card that I made for previews and never shared here. So she is perfect to go up today. Frankie is so cute and quirky that I couldn't resist playing a bit with some of the neon Copic markers to give her a spooky glow. I added neon green to her hair, neon orange to the pumpkin pail and neon violet to her dress. At first I was a little like, "What did I just do!" 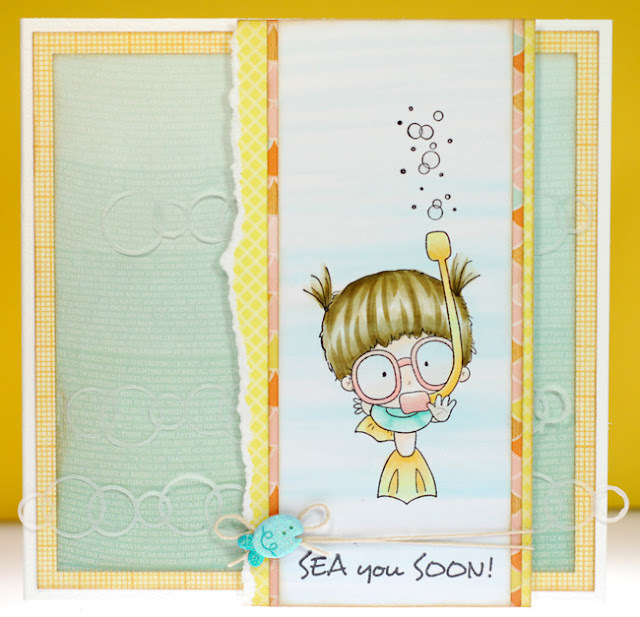 but when I paired her up with the bright stripes of the Doodlebug paper it worked, so I could breath a sigh of relief. The skin tone is that funky E70s combo that I like to pull out for Halloween and all of my little un-dead ghoulies. 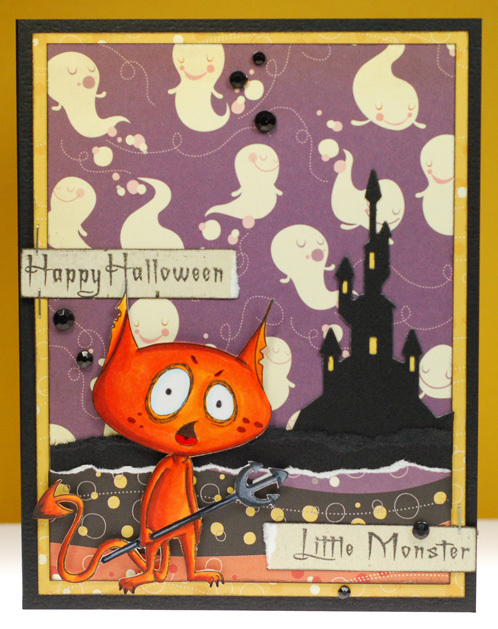 I've gotta say that I always look forward to Halloween cards because they give me the freedom to really go crazy with more 'out there' color combos, which totally gets me out of any creative rut I may find myself in. So the update on Mom is that she is still at Virginia Mason, still on dialysis, but working hard with her physical therapists to become mobile enough to be transferred to a rehabilitation/care facility back in Wenatchee. This would get her much closer to home and the entire family is hoping that this will happen soon. So we are praying for her growing strength and the continued healing of her kidneys. Thank you to every one of you that has been keeping her in your prayers and well wishes, it truly means the world to me. Alrighty friends, time for me to head to work. TTYL! It's probably no surprise to you that I'm on the run again today. Yep, I'm making my way back over to Seattle to hang out with my mom who is still in the hospital. The good news is that we are hoping to finally get her back home before this month is over... yeah! The papers are all random scraps that I collected from my scrap bags, which always gives me a satisfying feeling when I use up a bit more. 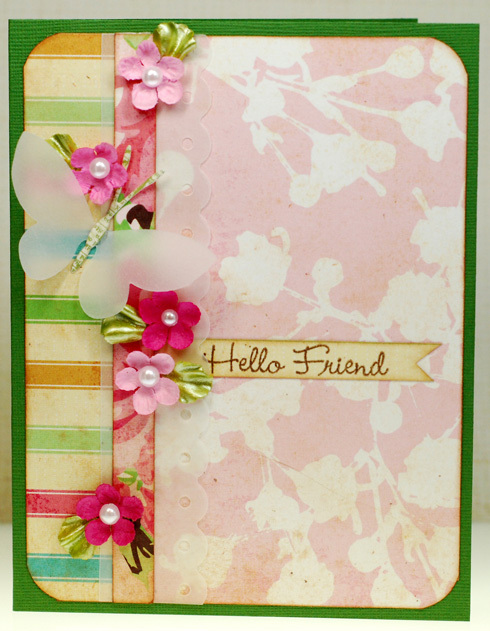 Now if I can just keep up that trend I might actually start to make a dent in my scraps, LOL! Big thanks again to everyone who came out for the reveals and said such nice things about our new spooky friends... without you they wouldn't be nearly as much fun! I'm off to work today but before I go I just wanted to share the preview card that I made with the super cute new Pumpkin Laugh stamp. I love those Laugh girls I tell ya! So even though I'm sure you're still feeling the summertime heat, hopefully this new release will get you ready for cooler fall days and celebrations! As we trek deeper into the wood and the moon disappears behind a bank of clouds it's easy to feel a bit lost and unsure of the way back home. Luckily I can see a soft glow filtering through the trees guiding us forward. There in a small clearing sit three carved jack o'lanterns shining bright. And perched atop each one is a familiar face. These little characters are taking a break from hanging out with the witches, Hazel and Hilda, and instead they are sharing their spooktacular adventures with each other. Luna the owl is chuckling about the latest broom races while Vlad the bat is boasting about his recent batch of malevolent morsels being cooked up and Lucy the black cat is quite insistent that Hazel could use some flying lessons before she goes back up on a ride with her again. It's easy to get caught up in their chatter but as the first faint rays of dawn light the sky the trio of Halloween critters insist it is time for bed and we can finally see the way back home. 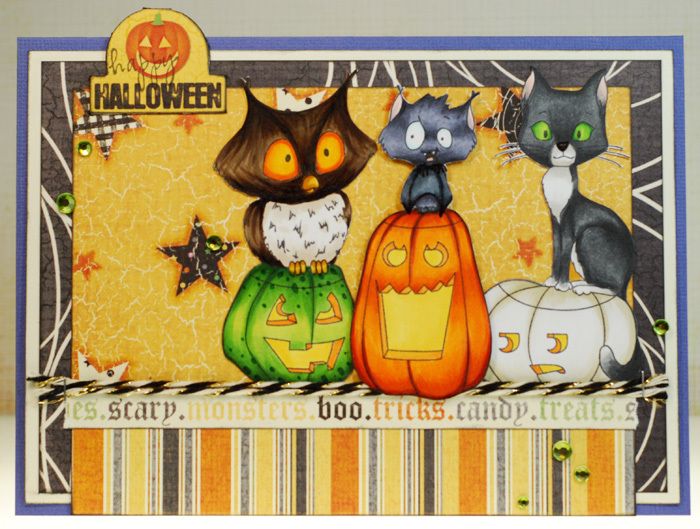 So it is time to say our goodbyes and grab some Halloween candy for the road... yum! 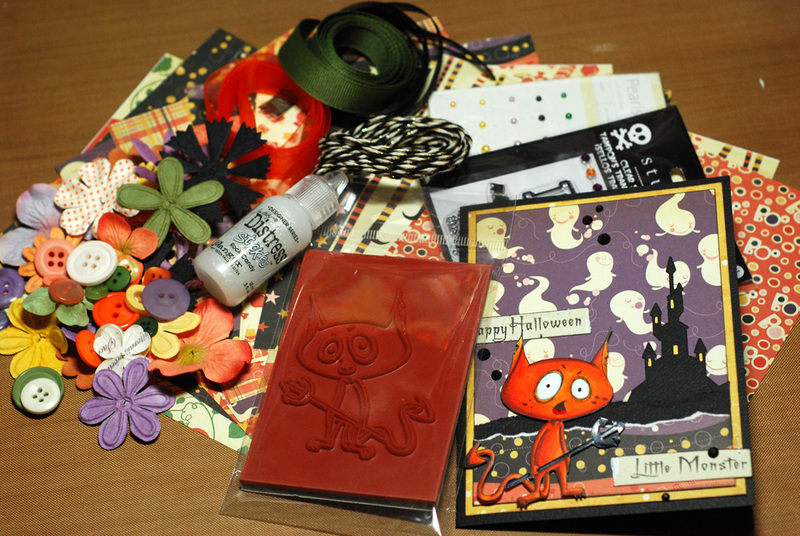 The Three Pumpkins candy kit includes; one Sweet November Three Pumpkins set rubber stamp, ten 6x6 sheets of My Mind's Eye Spooked paper, small Studio G acrylic sentiment stamps, Prima flowers and Kaiser Craft pearls, ribbon, twine, buttons, Rock Candy stickles, four envelopes, four card blanks and my card. The candies will stay open through tomorrow Friday, August 3rd and I will announce the winners on Saturday, August 4th. And just so you know... all of the new August stamps will be available for purchase tonight at the ATS store. And with that we have another Sweet November release in the books. It's a little spooky and a little crazy but isn't that what Halloween is all about? Thanks so much for joining in all the fun and don't forget to run on over to the ATS blog for even more chances to win today! The Gobsmack the Goblin candy kit includes; one Sweet November Gobsmack the Goblin rubber stamp, ten 6x6 sheets of Cosmo Cricket Matilda paper, small Studio G acrylic sentiment stamps, Prima flowers and Kaiser Craft pearls, ribbon, twine, buttons, Rock Candy stickles, four envelopes, four card blanks and my card. That wraps up day two of our August SN previews... I hope we haven't scared you off with this wacky goblin. 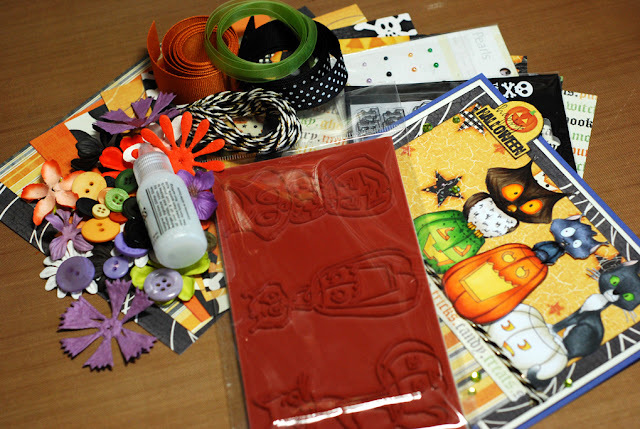 Be sure to come back tomorrow to see who else is joining in the Halloween fun!